We revisited our SLI to decide whether or not to include some cosmetics companies, a sector which we had largely ignored in previous years on the grounds that the category was essentially sold wholesale and was prone to discounting. We looked at a number of beauty groups but only three really stood out in terms of size and focus: L’Oréal, Coty and Estée Lauder. L’Oréal did not make the cut, even though, with over €22 billion in sales, it is one off the biggest cosmetics groups in the world. By its own admission only 26 percent of its sales are luxury and we felt that its stock fundamentals are closer to that of mass consumer brands. Coty, despite being one of the leading participants in the fragrance market, also did not qualify. 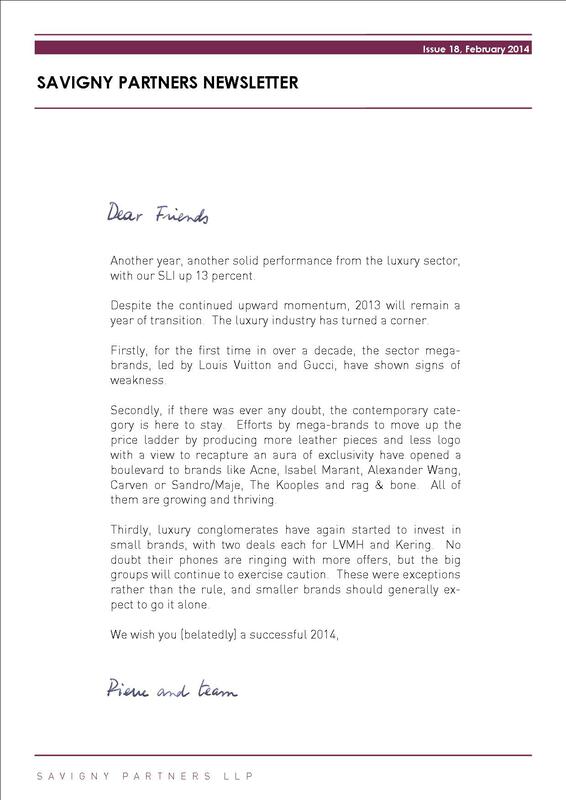 Too many of its brands would not qualify as luxury, and most of them are under license. Again we feel that it is essentially a mass consumer play, albeit focused on the beauty category. Estée Lauder Companies, on the other hand, made it, and we are proud to welcome it in our SLI. The group is a key player in all three pillars of the cosmetics industry: skincare, fragrance and colour cosmetics. Its brand portfolio, which includes Estée Lauder, Clinique, Origins, MAC, Bobbi Brown, Aveda and Jo Malone, is weighed more towards luxury, and accordingly its brands tend to be distributed in selective wholesale channels. Some of its brands also benefit from their own retail. Moreover, Lauder management has made a conscious effort over recent years to wean itself off the American tradition of promotion and gift-with-purchase, which in our mind was incompatible with the luxury sector. With €7.5 billion in turnover, Estée Lauder Companies is the leading luxury cosmetics group. Dominant in the US (42 percent of sales), it has nevertheless developed a strong presence in Europe (37 percent of sales) and Asia (21 percent of sales). The company’s biggest segment is skincare, contributing 44 percent of sales, with colour cosmetics (38 percent of sales) and fragrances (13 percent of sales) next. 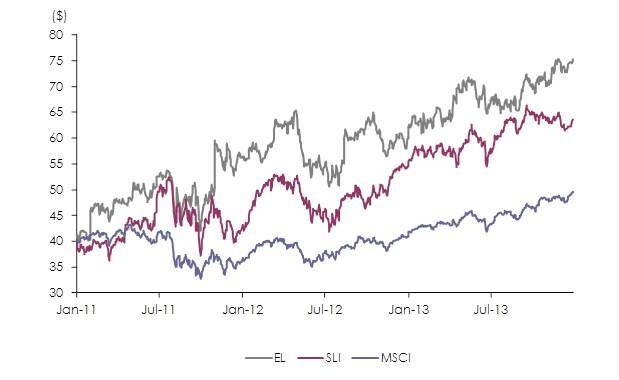 Since the beginning of 2011 Estée Lauder’s share price has broadly tracked the SLI. However it has largely escaped the recent softening caused by worries about mega-brands and China, and finished the year 26 percent higher (in local currency). Asia seems a bright market opportunity for prestige skincare brands, with women continuing to trade up. The group is currently valued at a sales multiple of 2.8x and an EBITDA multiple of 15.5x, a premium of 13 percent over the SLI EBITDA multiple of 13.7x. In 2013, the Savigny Luxury Index (‘SLI’) gained 13 percent, coming just short of the MSCI World Index (‘MSCI’) which gained almost 16 percent. The SLI’s performance is in sharp contrast with last year when it had increased by 24 percent and outperformed the MSCI by 12 percentage points. 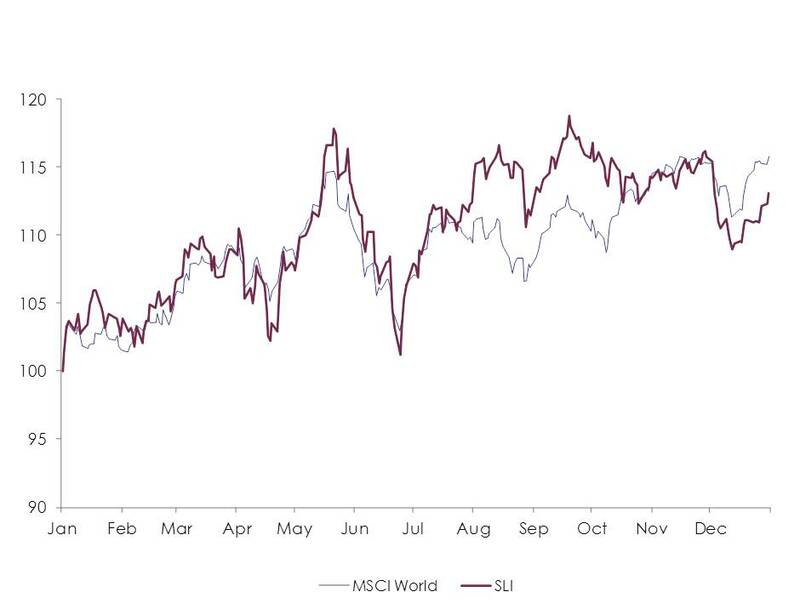 Both indices closely matched one another until mid-summer, and together fell victim to a yo-yo effect driven mainly by expectations of the Fed’s stimulus package and resulting prospects for the US economy on one hand, and by policy announcements and economic data from China on the other. Despite increasingly loud rumblings of a Chinese slowdown and decelerating mega-brands, the SLI made a brief comeback over the summer as accelerated tourist spending and improved demand in Japan helped luxury sales for the first half of the year. The market also welcomed LVMH’s €2 billion takeover of Loro Piana in July. This brings yet another large and iconic brand into the portfolio of the world’s leading luxury group, but it also provides LVMH with access to a strategic platform and know-how in precious fabrics and their supply chain. In October, LVMH’s lower than expected third quarter results, driven by a sharp slowdown in Louis Vuitton’s growth, cast a shadow over the sector, confirming that appetite for mega-brands was indeed cooling down. 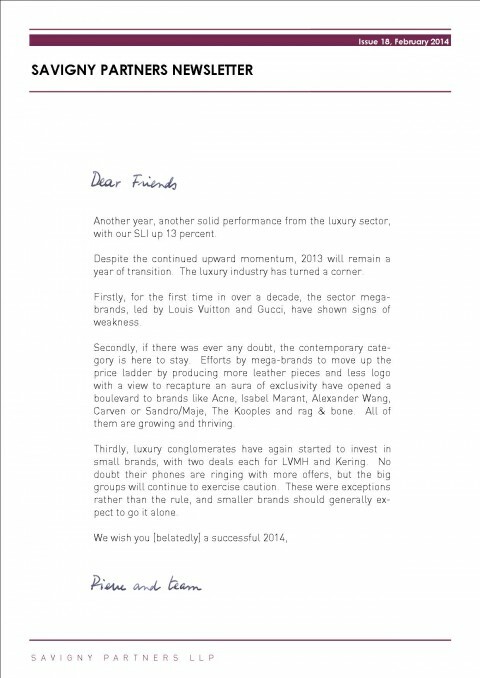 Kering then also announced that growth demand for its flagship Gucci brand was waning. These announcements, coupled with profit taking in December, caused the SLI to tumble by over 3 percent over the quarter, ending the year below the MSCI. 2014 will be a key year for the sector. We do not anticipate any aggressive expansion plans for most of the industry but rather a focus on improving existing operations. 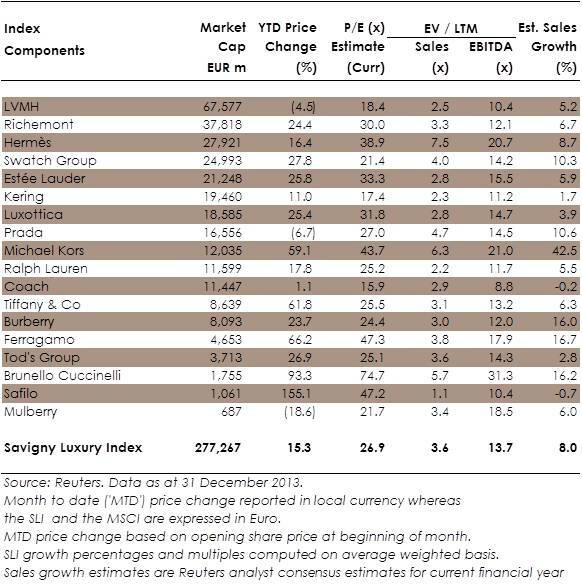 Bucking the trend will be, at the opposite end of the sector’s price ladder, ultra-luxe players such as Bottega Veneta or Berluti and affordable luxury/contemporary brands, both of which will seek continued expansion.